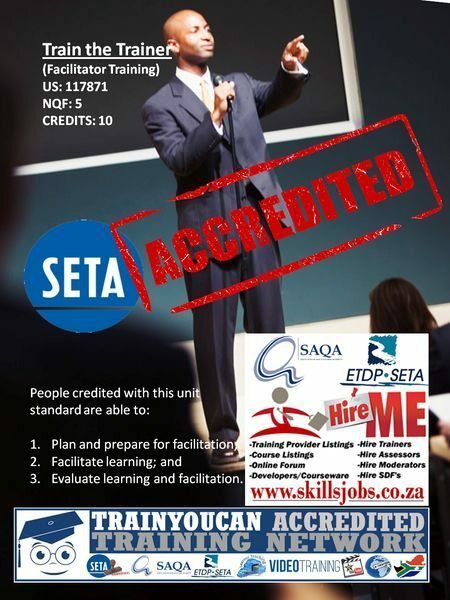 Train the Trainer [800x600]" width="150" height="200" srcset="http://www.ecourses.co.za/wp-content/uploads/2016/07/Train-the-Trainer-800x600.jpg 450w, http://www.ecourses.co.za/wp-content/uploads/2016/07/Train-the-Trainer-800x600-225x300.jpg 225w, http://www.ecourses.co.za/wp-content/uploads/2016/07/Train-the-Trainer-800x600-300x400.jpg 300w" sizes="(max-width: 150px) 100vw, 150px" />Currently there is no stipulation/guidelines on any SAQA policy to become a certified/accredited trainer, also knows as facilitator. The industry norm is that all trainers must have at least obtained an OBE or Outcome Based Education certificate in Adult Education and Training on a NQF level 5 or higher. 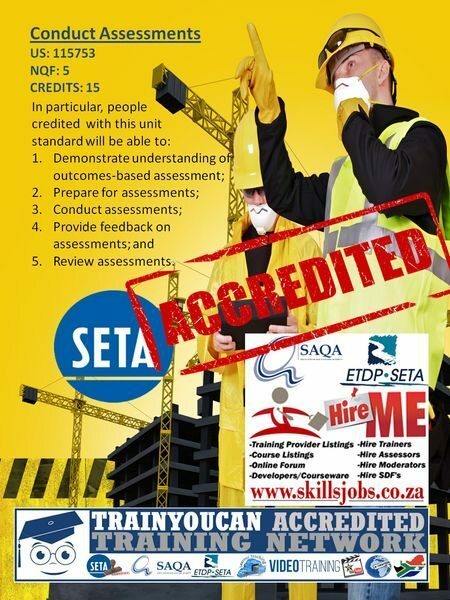 Currently the more acceptable choice or preferred will be unit standard 117871, previously 9957, also completed through the ETDP SETA – Education, Training and Development Practices Sector Education and Training Authority, that is ultimately responsible for Education and Training nationally in South Africa between the SETAs. Moderator-800x600.jpg" alt="Moderator [800x600]" width="181" height="242" srcset="http://www.ecourses.co.za/wp-content/uploads/2016/07/Moderator-800x600.jpg 450w, http://www.ecourses.co.za/wp-content/uploads/2016/07/Moderator-800x600-225x300.jpg 225w, http://www.ecourses.co.za/wp-content/uploads/2016/07/Moderator-800x600-300x400.jpg 300w" sizes="(max-width: 181px) 100vw, 181px" />The newly qualified assessor may continue with his/her studies and decide to qualify as a moderator. The candidate would then complete training on the moderator unit standard 115759 (previously 9929 or 7977) and would follow the exact same process as outlined above – certification by the ETDP SETA. This unit standard is intended to cover any situation in which moderation occurs, whether this be internally, i.e. within the ambit of the provider-assessor, or externally through cooperating providers, or externally through professional bodies and quality assurance bodies.